The No. 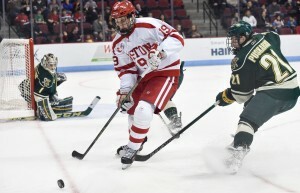 2/3 Boston University men’s hockey team just keeps on winning, and did so again in the form of a 6-3 victory over the University of New Hampshire on Friday night at Agganis Arena. The Terriers now own the longest winning streak in the nation at seven — its longest win streak since the end of the 2009 championship season. The second line of junior forward Ahti Oksanen, sophomore forward Robbie Baillargeon and senior assistant captain Cason Hohmann has been clicking as of late, and accounted for seven total points on Friday against the Wildcats. Andrew has more on that in his sider. A pair of BU defensemen also found their way onto the score sheet against UNH: junior captain Matt Grzelcyk and freshman defenseman Brandon Hickey. Neither is a stranger to offensive production: Grzelcyk has two goals and 17 assists on the year, adding to his goal total with his tie-breaking goal with 2:50 left in the second period. 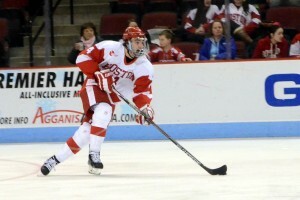 Hickey, with his powerful shot, was able to tally a goal and an assist, boosting his season total to five goals and nine assists. 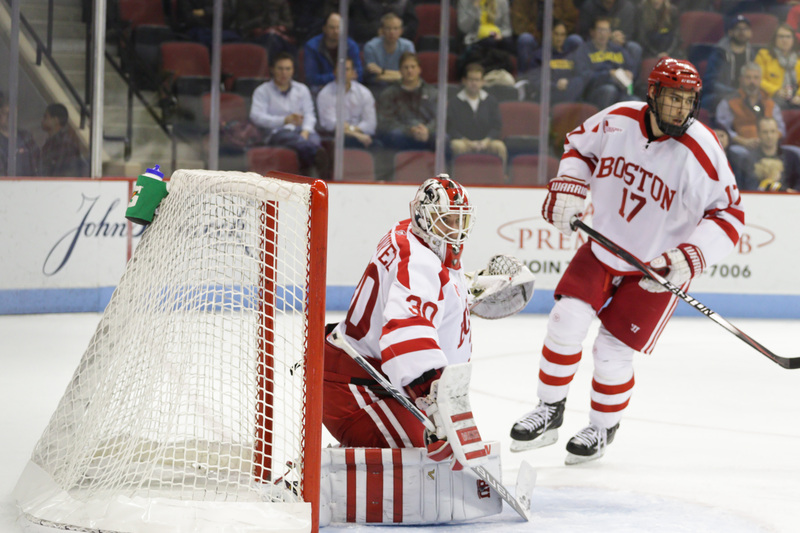 BU head coach David Quinn had nothing but praise for Hickey’s production after the game. “He works incredibly hard,” Quinn said. “Loves hockey, has got a passion for the game, he’s got enthusiasm that’s infectious. He’s got a bunch of physical skills: he skates well, he shoots it a ton. Does a great job getting a shot to the net, but it’s hard it’s low. He’s physical, he’s good defensively. The Boston Hockey Blog fully endorses Hickey’s postgame attire from Friday night, which included a white cap with a picture of Hohmann’s face taped to the front. BU — a team that entered the game giving up an average of just 2.15 goals per game — allowed UNH to tie the game at three goals apiece, less than three minutes after the Terriers had taken a 3-1 lead. How did they make that adjustment? Simplicity. It’s pretty hard to criticize a guy who just got 27 points in 11 games, but it was still a bit disappointing to see senior assistant captain Evan Rodrigues’ point streak end on Friday. He had four shots on goal against UNH, but none could cross the goal line. All good things must come to an end, I suppose. BURLINGTON, Vermont — A three-goal advantage almost was the most dangerous lead for the No. 3 Boston University men’s hockey team Friday night. The Terriers (14-4-4, 9-2-2 Hockey East) opened up a 3-0 lead early in the third period, and staved off a late rush by No. 12 University of Vermont to come away victorious 4-2. The win, coupled with a No. 5 University of Massachusetts Lowell loss to No. 18 Providence College, puts BU into sole possession of first place in Hockey East. Not since Nov. 22 at the University of Connecticut had Cason Hohmann lit the lamp. Two months, one day and one lengthy video review later, he finally broke the streak. During the midst of a BU power play at the end of the second period, sophomore center Robbie Baillargeon fed Hohmann near the goal line, who roofed the puck into an almost empty net. After the refs initially ruled the puck didn’t cross the goal line and the period came to a close, the officials took a long look at the replay and overturned the call. 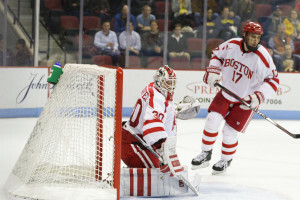 Speaking of Hohmann’s tally, the goal extended BU’s stretch of games with a power-play goal up to seven. You have to go all the way back to Dec. 6 for a game in which the team did not score a goal on the man advantage. Even when it’s not scoring, the power-play unit, save for a few shifts, has moved the puck well, and gotten good shots to the net. In all, the Terriers finished 1-for-5 on the night, garnering 12 chances on net. This was against a UVM (15-7-2, 7-5-1 Hockey East) team that came into the game as the best penalty-killing group in Hockey East with a success rate near 93 percent. Not too shabby. 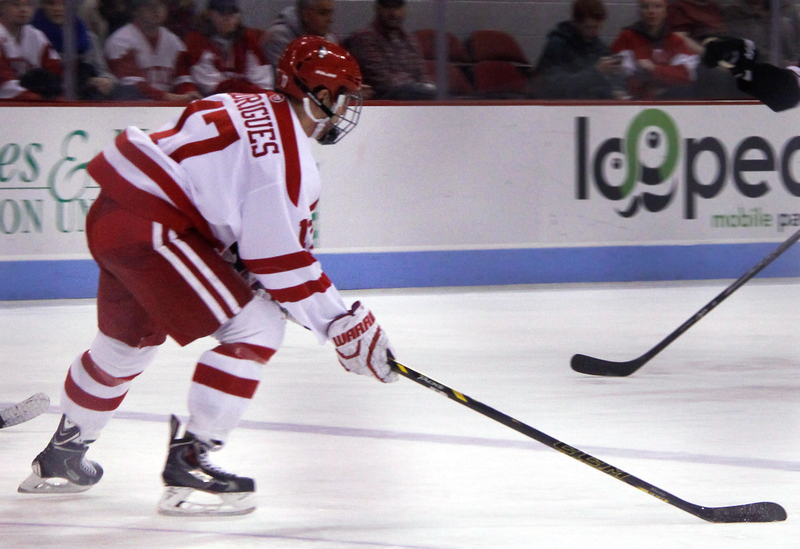 When Baillargeon scored BU’s first goal of the season against the University of Massachusetts Amherst, he picked up right where he left off during his freshman campaign. Then the mononucleosis kicked in. He missed significant time in the first half of the year because of it, and only returned to the lineup after winter break. He had looked good in his games back in the lineup, but nothing as sharp as tonight. Baillargeon skated well and made two crips passes that turned into primary assists on BU’s first goals of the game. The two helpers earned him well-deserved No. 3 star of the game. Taking the puck from the defensive zone, senior assistant captain Evan Rodrigues skated down the left side of the ice, deked around defenseman Ori Abramson and picked the top corner of the net to finish off a pretty goal 3:02 into the third period. An impressive end-to-end tally, yes, but it also proved to be pretty important in the long run of the game. Vermont rallied off a goal not even a minute later, and then added another in the closing minutes. Rodrigues’ goal at first looked like window dressing on a win, but ended up as the game-winner. When goaltender Brody Hoffman let in his third goal of the night early in the third frame, coach Kevin Sneddon pulled the netminder in favor of Mike Santaguida. It didn’t take long for the Catamounts to get the message. The Terriers, on the other hand, didn’t look ready for the surge. Forward Colin Markison snuck one past junior goaltender Matt O’Connor 52 second after the Rodrigues goal to cut the BU lead to two goals. And although it took over 11 minutes for UVM to get that second goal, it wasn’t as if the Catamounts didn’t have their chances. Whether or not replacing the goalie was the reason Vermont played better in that span in the third, there was no arguing the ice tilted some in the Catamounts’ favor. If you had forgotten about defenseman Alexx Privitera, he made sure you remembered him Friday night. The former Terrier, playing in his first season with the Catamounts, already had a respectable 15 points in 23 games coming into this one. By the end of the game, he added one more point to his season total, a rebound goal at the 15:17 mark of the first period. It ended up as just a footnote in this game, but it would’ve been something if Privitera scored a game-winning or tying goal against his old team.